The latest issue of the Automotive News Europe monthly e-magazine goes live on Monday, Feb. 29. 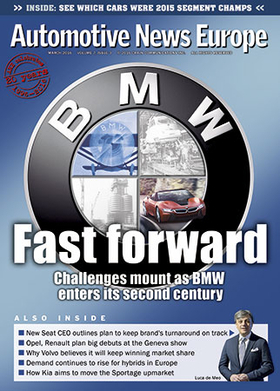 This month's edition looks at the challenges facing BMW in its second century. These include keeping pace with rapid change during what is commonly called the Fourth Industrial Revolution, as well as battling a resurgent Mercedes-Benz, coping with slower China car sales and preparing for rising competition from tech juggernauts Google and Apple. Our cover story examines how BMW will tackle those challenges. BMW later this month plans to unveil its updated business strategy, which will look at the needs of premium car buyer as far as 20 years into the future. Ian Robertson, the head of sales and marketing for the BMW brand and responsible for all sales channels across the group, shared his views on how the automaker will further improve its customers’ experience. From Germany to Spain, where Seat CEO Luca de Meo was given a tough task last November: make the perennial money-loser a winner for parent Volkswagen Group. De Meo outlined his plans in an interview. Volvo CEO Hakan Samuelsson foresees plug-in hybrids gaining greater acceptance in Europe at the expense of diesels. He also expects the Swedish automaker to continue taking market share from rivals. He explained why. PSA/Peugeot-Citroen’s European sales grew as a slower pace than the overall market last year, but the French automaker isn’t worried. After flirting with bankruptcy in 2013, profit is the priority, not volume, PSA’s Europe boss Denis Martin told us. Lapo Elkann, the middle grandchild of former Fiat Chairman Gianni Agnelli, has re-entered the auto business with Garage Italia Customs, a Milan-based company that specializes in custom bodywork, paint and upholstery. Elkann detailed his plans for the business and shared his views on the auto industry. What is next for alternative powertrains in Europe? Sales of hybrids and plug-in hybrids will triple to more than 750,000 units in the next three years, analysts predict. This month our Latest Launches section reviews the new Sportage SUV, which Kia says is roomier, more upscale and drives better than the model it replaces. On the connected car front, we discussed the many challenges that need to be overcome on the road toward autonomous driving with Ford Chief Technical Officer Raj Nair and examined in which direction disruptors such as Goggle and Apple are headed next. SUVs and crossovers benefited most from Europe’s better-than-expected sales surge last year. Combined sales of models including the Renault Captur, Nissan Qashqai, Audi Q3 and even the aging Volvo XC60 increased 22 percent to 3.05 million units, that rise easily outpaced the overall market’s 8.1 percent increase to 13.7 million. Our exclusive annual by-segment analysis of the European market based on data from JATO Dynamics shows that SUVs and crossovers accounted for 22 percent of the region’s total vehicle sales in 2015, up from 20 percent in 2014 and 17 percent in 2013. See which segments are suffering most from the rising demand for SUVs and crossovers. Enjoy this special issue that also marks the 20th anniversary of Automotive News Europe.